There will always be buyers who are willing to purchase real estate properties. 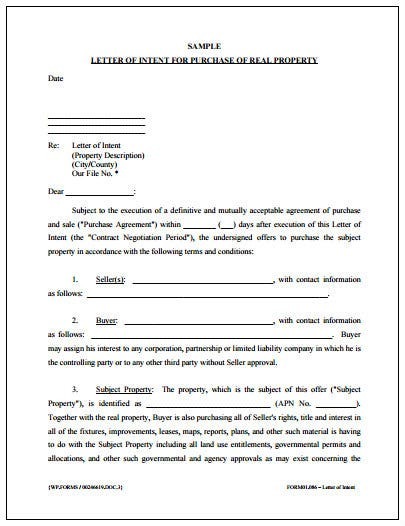 However, to show the property owners they are interested, they will need to send a document which does exactly that. 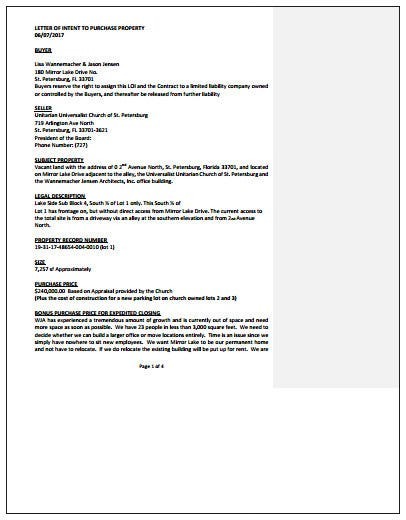 This type of document is what you call a letter of intent and this article will teach you how to make one. The seller will definitely want to know the person or business that is interested in purchasing his/her real estate property. This means that you will need to provide your basic information into the letter. Include your complete name, address, and contact details when placing the information into the document. Never forget to place the date in which you made and sent the letter. This is so that the seller can confirm as to when you managed to inform him/her about your intent to purchase the real estate property. Make sure that you are able to include the month, day, and year when writing down the date. To make sure that the seller knows that the letter is for him/her, you will need to place the right information in the letter. What this means is that you are going to have to put in the seller’s complete name and address. That way, you can also guarantee that the letter makes its way to the right place and person. Now is where you can get started into making the actual content of the letter. You should start by properly greeting the seller. Take note that this should come in the form of a formal business letter, meaning that you the tone must be respectful and professional. When greeting, put in either “Mr.” or “Mrs.” along with the seller’s last name. The next thing that you are going to have to do is to state the purpose of the letter. Provide information on what it is that you intend to purchase. Be sure to include necessary details such as the type of real estate property that is being sold, how much you are willing to offer, and so on. Remember that this is a formal letter, meaning that you will need to properly thank the reader or his/her time spent in going through your letter. When you’re done, you may then place your complete name and signature at the bottom as this will be used to confirm your identity. In the event that you have any intention to purchase a particular real estate property, you will need to send the owner of that property a letter which notifies him/her about your intentions. 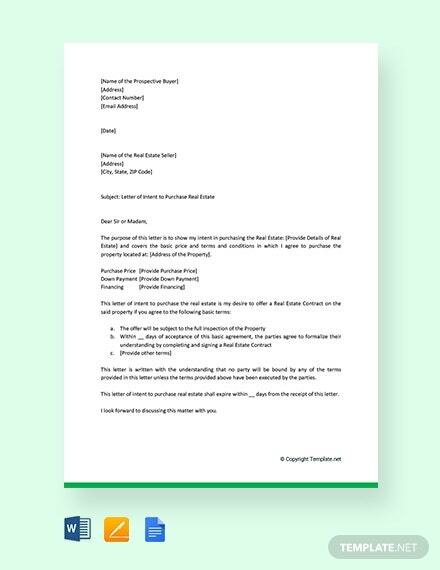 You may download and use this particular letter template to help you make the very document you need. If there are sellers who are willing to sell just about anything they own at reasonable prices, then you will most likely need to convince them that you are the best person to buy what they’re offering. 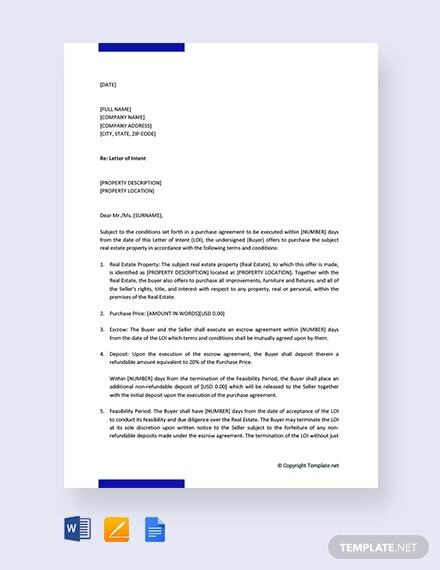 With the help of this template, you can produce a letter which clearly shows your intention to buy whatever it is that you specify to the seller. 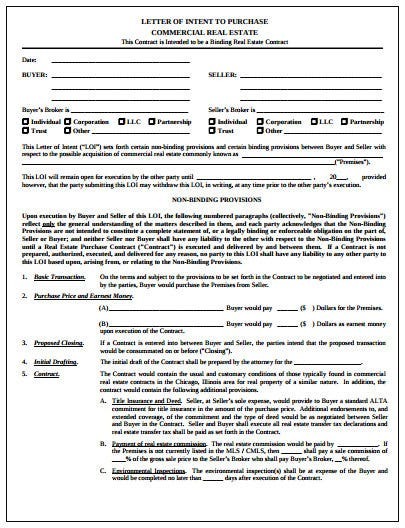 Before one can enter a contract to purchase real estate, that person will first need to inform the property owner regarding his/her intentions. With the help of this template, you can point out things such as what kind of real estate property you would like to buy and how much you’re willing to buy it for. One of the hardest things to do is to decide if whether or not you should purchase real estate property. If you have already made a decision on a particular one, then you will want to make use of this template. Use it to make a letter which shows your clear intentions of wanting to purchase the real estate property that’s up for sale. 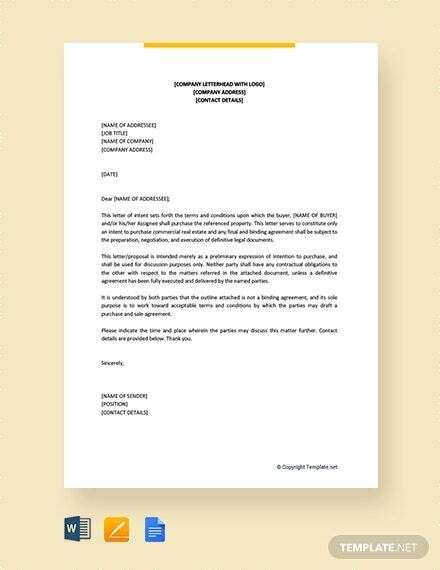 If you are planning to make a simple letter that shows how willing you are to buy a specific real estate property, then this is definitely the template for you. Make sure that you are able to use programs such as Apple Pages or Microsoft Word as you will need them to make whatever changes you want to the letter. Remember that should you ever wish to purchase any commercial real estate properties, you will have to come up with a convincing letter which shows that you’re the best person to sell it to. With the help of this template, you can provide all of the information that should help you get what you want.